Best Exersaucers, Walkers & Jumpers | Are Walkers Good for Babies? 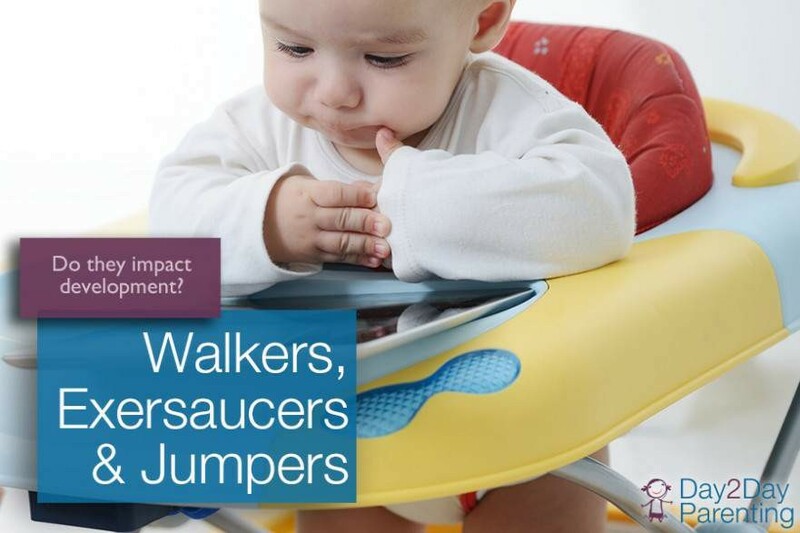 Home Most Recent Early Intervention Articles Walkers, Exersaucers & Jumpers: Is There an Impact on a Baby’s Development? More and more baby “exercise equipment” becomes available to parents every year and often parents ask us questions during therapy sessions and evaluations such as “Should I get a walker for my baby?” or “Will using a bouncer help strengthen my babies leg muscles?”. It is an important question to ask, as your baby’s natural development should be considered. What is the best exersaucer for my baby? Should I use one at all? You will find varying opinions on the use of baby equipment depending on whom you ask, and even among physicians, physical therapists and developmentalists the views will vary. Some therapists are adamantly against using this type of equipment, however, many therapists I have talked to recently agree that “in moderation” the supervised use of stationary exersaucers & jumpers can be fine, while agreeing these items should never be used as a “babysitter”. One thing you should know is that the American Academy of Pediatrics has called for a ban on walkers with wheels. The APP has stated that over 8,000 babies per year are injured by using walkers on wheels. Injuries include burns (the walker makes them higher off the ground & more easily able to reach the stove & table top), falling down stairs (child pushes into door while in walker), drowning (falling into bathtub or pool while in walker) and even poisoning (again by being able to reach things they ordinarily could not if they were not seated in a mobile walker). New guidelines for the manufacture of walkers on wheels were put into place in 1997, which required them to be wider so they did not fit through doorways, as well as including lock in place brakes. But, this has not dramatically decreased injuries since most babies in walkers on wheels are obviously “on the move”. The APP suggests never buying a walker on wheels for any child & if you own one they suggest you throw it out (May 13, 2011). And so this brings us to the stationary model of a walker we call an exersaucer. The above named doctors advise that a stationary play gym like an exersaucer can be a safer alternative to walkers on wheels and does not typically harm a child’s development. But not everyone agrees. While this piece of equipment does not move forward or backward, it does allow a child to sit upright and rock, bounce and spin. Often I see people putting kids as young a 3 months into these things saying “they love it” because they can sit upright and view what’s going on…but their little feet are just dangling or their entire body is slumped forward or backward. Conversely, I have seen kids way too big in exersaucers as well, unable to fully straighten their legs. So, what could be wrong with an exersaucer you ask? Physical therapists have said that this piece of equipment, while again ok in moderation (for example 20 minutes per day (30 max), preferably 10-15 min per occasion), can do several things that interfere with typical development. First, they tend to hold a baby’s hips in an extended position and secondly they prevent a child from seeing his feet which is necessary visual feedback a child needs when learning to move by himself. Also, we see kids pushing up often on their toes to spin and bounce and some children later become “toe walkers”. While an exersaucer seems to be fine to entertain a child while cooking dinner or doing other short chores, no child, especially a child with underlying special needs related to motor development (high or low muscle tone) should use this piece of equipment for more than a short period of time each day. Ok, so now what about those jumping devices babies seem to love so much? Again, in moderation most will say they are fine. But, keep in mind that babies have been severely injured in the jumpers that are suspended from doorways. Stronger babies have bounced so forcefully that they ended up hitting the sides of the doorways with their heads. There have also been recalls on the doorway jumper due to clamp failure which caused the entire apparatus to fall from the ceiling. Because babies tend to jump forcefully in these things they do not learn slow controlled movements needed for walking, some kids develop a tip toe pattern of movement and he jumper does nothing to help strengthen trunk, core & leg muscles needed for balance and walking (San Diego Children’s Hospital). If you must have a jumper, then go for the stationary kind and always use it supervised and in moderation (again 20-30 max per day & not all at once). The bottom line is that none of these pieces of equipment actually help a child learn to walk and in fact some can delay this skill. Also, as previously stated above, children may overdevelop their calf muscles instead of their quad muscles & hips needed for walking and then once walking continue to use a toe-walking pattern. Several studies have shown that children who repeatedly used walkers, jumpers and exersaucers for long periods actually walked up to a full month later than children who did not use this type of equipment. Well, then what are safe alternatives? Remember the good old fashioned play pen? It is still a safe place to put your baby when you are busy cleaning, cooking or have larger kids or pets running around the house. In a play pen, a baby can still move about freely, pull to stand & cruise as if they were on the floor without risk of injury. Do keep in mind that if at all possible play pens and play yards should be purchased new, due to manufacturing guidelines that changed around the year 2000. The March of Dimes gives some tips on choosing safe play pens on their website. Keep in mind that a high chair is another safe alternative where baby can play while seated in a 90-90-90 position (back against the back rest, feet firmly on the foot rest, thighs parallel) and be out of harm’s way for short periods. Your very best alternative? Floor time! In today’s busy world, we find many babies have an immense lack of floor play time, not just due to using exersaucers or jumpers, but going from the car seat to the bouncer seat to the swing to the exersaucer to the high chair and back again! Playing on the floor is the the best place for a baby to learn and to stimulate his visual, sensory, gross, fine and cognitive skills. What makes it even better is if you get down on the floor and play with him!